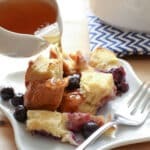 Tender, fluffy, lightly sweetened baked french toast, filled with blueberries and then drizzled with Lemony Maple Syrup was a huge hit in our house this week. To say that I loved this dish doesn’t even begin to express how pleased I was with it. For many years, I was under-whelmed with the baked french toast recipes I’d tried. Often too sweet, too soggy, too dry, or simply not flavorful enough, I stopped trying them years ago. This works so well because the bread is not soaked overnight. It absorbs plenty of moisture while it bakes and doesn’t become soggy in the process. When I found myself with an abundance of leftover Challah bread in the house, I figured it was time to try baked french toast once again. Oh my word, this is like no other baked french toast I’ve tasted before. With a texture similar to bread pudding, without being a bit soggy, this was everything I’d hoped and then some. 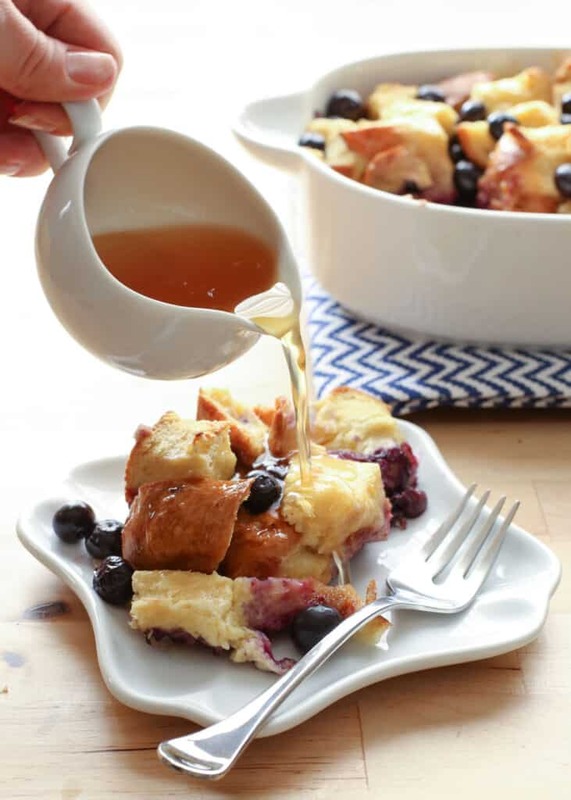 The lemon-y maple syrup cuts the typical french toast sweetness and the blueberries add a sweet tartness to the dish. It’s unusual for me to go crazy over a sweet breakfast. I’m much more of a savory breakfast person these days. This french toast is a wonderfully balanced sweet and barely tart blend of flavors. I found myself eating a second serving and then considering a third before I decided I’d best get the leftovers into the fridge immediately! Preheat the oven to 350 degrees. Grease an 8x10" baking dish with butter. 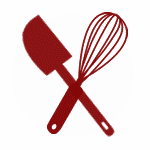 In a large mixing bowl, lightly whisk the eggs. Whisk in the half and half, vanilla, sugar, salt, and lemon zest. Stir in the blueberries and then add the chunks of bread. Toss gently to coat all of the pieces. Transfer the soaked bread and blueberries to the prepared baking dish and stir as needed to distribute the berries somewhat evenly. Cover with foil and bake for 20 minutes. Remove the foil and bake an additional 20 minutes, until the top layer of bread is lightly browned and just a little bit toasted. Stir together the maple syrup and lemon juice in a small pitcher or glass measuring cup. Heat in the microwave (or in a small pan on the stove) until warmed through, about 2 minutes. 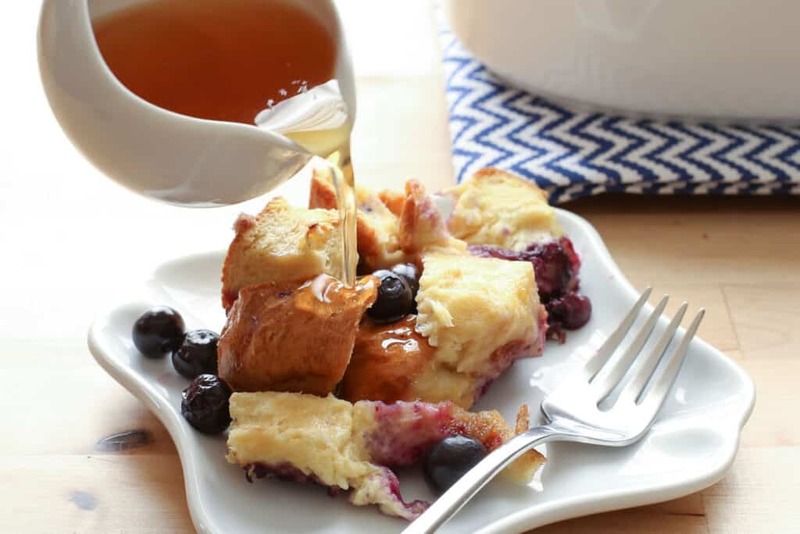 Scoop or slice the baked french toast and serve drizzled with the warm syrup. Enjoy! A 7x10" baking dish, a 9 or 10" square or round will all work for this recipe. You just need the cubes of bread to mostly fill the pan. The recipe can be doubled to fill a large 9x13 pan. This sounds fantastic!! I've pinned it! I love that you say this isn't a bit soggy - that fear of sogginess has kept me from ever trying baked french toast recipes. This sounds amazing! I have a breakfast-themed night at my church life group Tuesday and might try this out! Looks amazing! Made this for breakfast today with whole wheat bread. It was perfect! Not too soggy, not too dry, and sweet enough to eat without syrup. Everyone ate seconds, even my three year old who doesn't like bread. Next time I will cut back on the sugar and add some diced up cream cheese! Mary Have you ever tried French/Italian bread for this recipe?? I've made this with French bread too! The texture is best with the challah, but I would definitely make it again with a loaf of french bread. IBluberriesbger buns or Hawaiian bread that so sweet. After my breads cooked with blueberries in with them. I put one lage dolp of 2 lg boxes cooked lemon pudding mixed with one 8oz Sr cream on top. Then add more bluberries that have been Frozen. Serve immediately.